Swain, formerly known as This Routine Is Hell, have announced a European tour with Direct Effect in support of their new EP called Heavy Dancing. Their new effort comes out in March on Cobra Records and Ruins Records and will be available on black (400), red (200) and green (200) 7″ vinyl. On March 5th, Swain will kick off their tour in Hamburg, Germany. Check out the full routing listed below. They’re still looking for shows on March 9 and 11 – reach out to joe@statelesssociety.com if you can help. 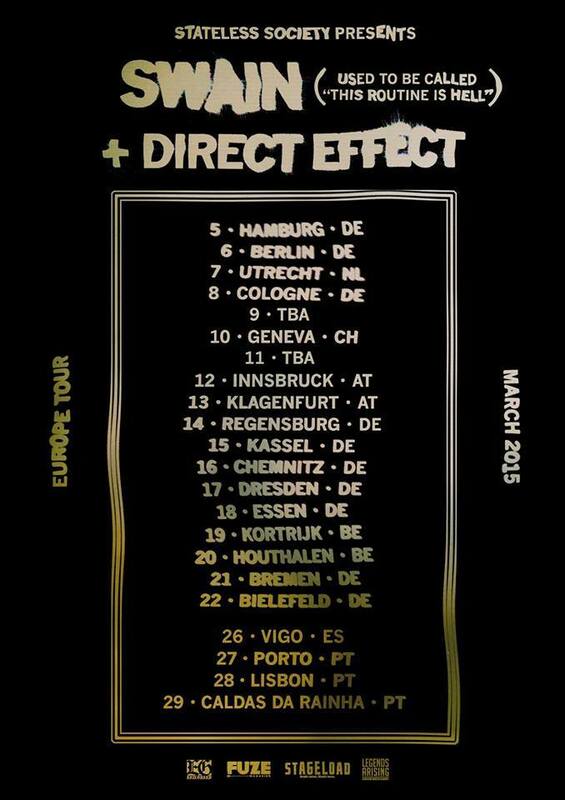 12.03.15 AT – Innsbruck @ P.M.K. Tags: Cobra Records, Dates, Direct Effect, Europe, European Tour, Facebook, Heavy Dancing, Pre-order, Ruins Records, Swain, This Routine Is Hell, Tour, TRIH. Bookmark the permalink.